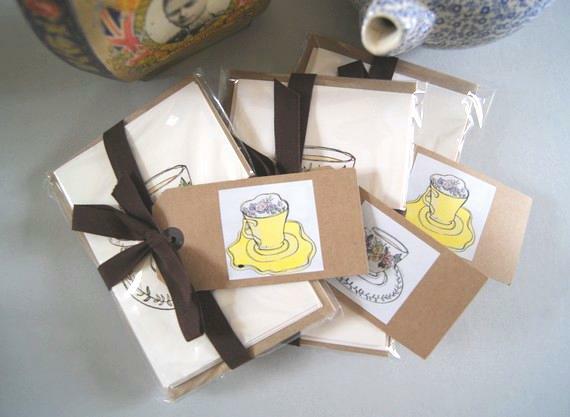 5 Cute and Quirky Tea cup and Coffee cup illustrations with a matching tea recipe/coffee recipe on the reverse. Giving helpful tips on how to make the perfect cup of Earl Grey, White Tea & Green Tea, Ginger Tea, Coffee and Mint Tea. All the cards are printed on conqueror ivory card with kraft fleck envelopes in a pack with brown ribbon and a tea cup label to write a special message to those you love or for yourself. Designed by artist Kate Lowe.